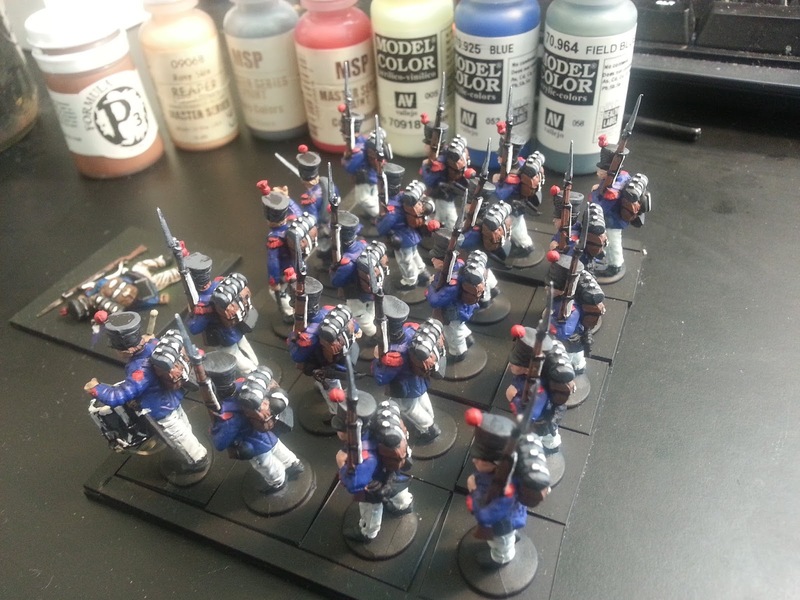 I quickly painted a regiment for Kings of War.. I am using Kingdom of Man list so these are Arquebusiers. 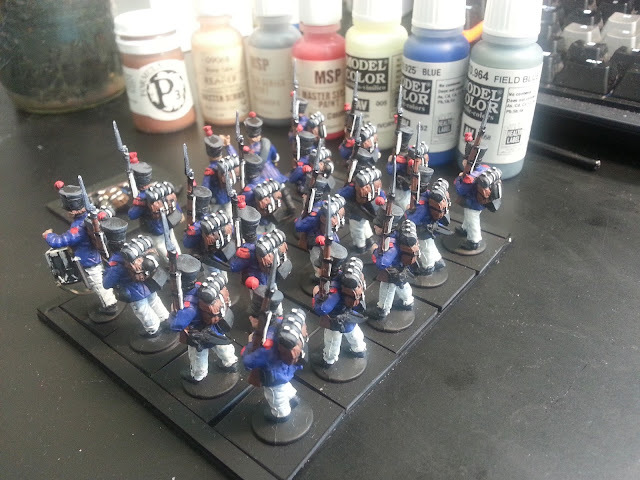 They are just Perry Miniatures plastic French Line Infantry. I will ink and detail them later, but I have only a few weeks to get colour on models before the first tournament of Kings of War.. early October! 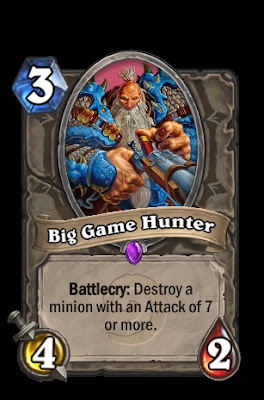 DAKKA!!! DAKKA!!! DAKKA!!! Take that, Jerry!! So with another Friday Night Fights in the books, we had a little bit of everything on the table. I hosted and was able to setup a Flames of War table and an area for me to try out Kings Of War. 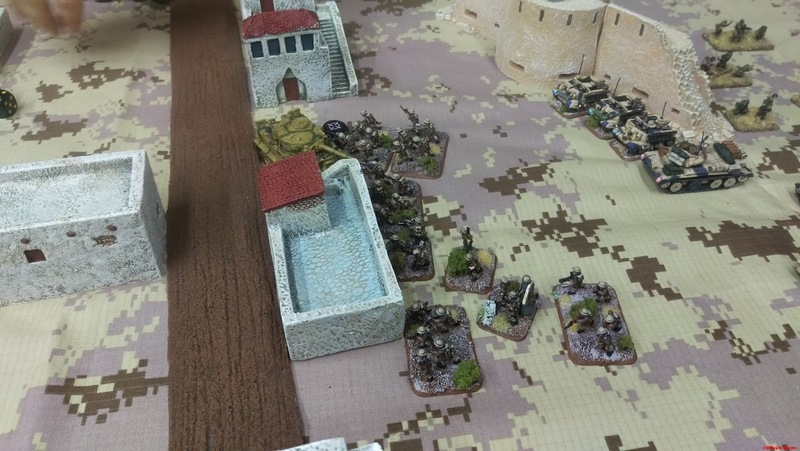 It's a 28mm fantasy battle game where it is fast, easy to learn and actually fun to play. Yes, I said fun. I am a huge skeptic when it comes to playing anything 'fantasy' related. I never got into the Warhammer or the 40K of many years ago. I think I wanted to, but likely couldn't afford the models. I played Battletech, a ton of other RPG type games and of course military strategy games like 'Escape From Colditz', 'Axis and Allies', 'Shogun' and of course 'RISK'. 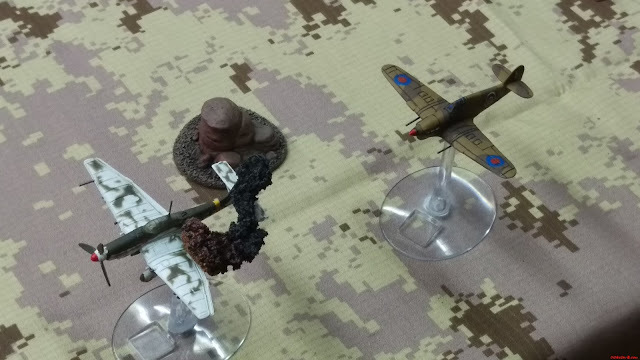 This particular video was from last week, when Dennis and I had a night to practice our Flames of War Mid-War lists for Canadian Nationals, coming up in September. 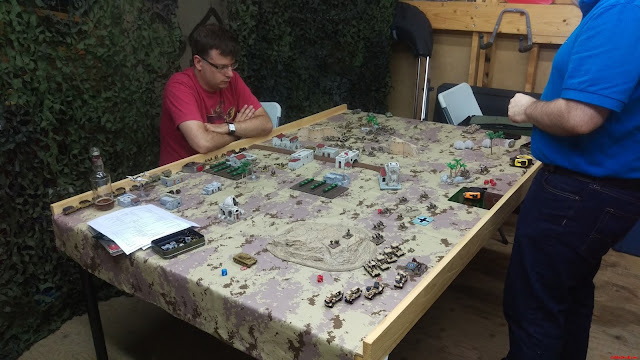 Normally we have been playing elsewhere, but with not a lot going on due to scheduling conflicts and summer holidays winding down, I decided to setup a desert table in the 'War Room'. 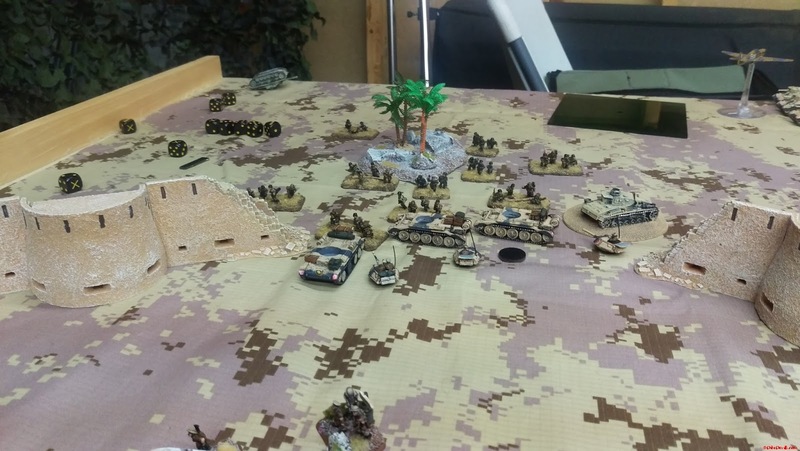 Duane had a pretty decent German list to take on Den and his Brits (New Zealand from N. Africa). Duane looks on and plans his next move. They rolled up 'Encounter' and it was a lot of back and forth in the opening turns. Duane was not able to save his Tiger from being assaulted in the middle of town. He did manage to kill a few stands in Defensive Fire, but ultimately failed a check to stay in the fight, the crew ultimately fled the Kiwi onslaught. Carriers move in to try and secure the objective from the grip of a few lone stands of Infantry. Duane would come out of this a little better. 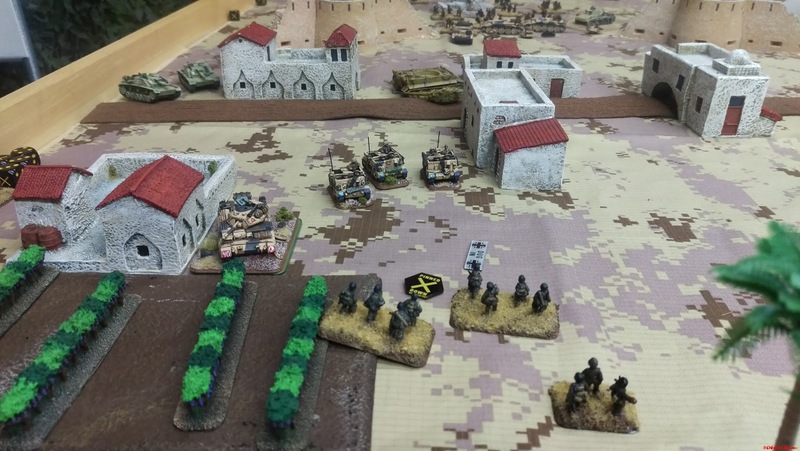 The Sturmgeschütz III platoon in the top left of the frame came to the aide of their comrades and destroyed the Recce platoon. This, after a mistake was made in not being able to come into base contact for assaults. This error would cost Dennis the game and more victory points for the Allies. German Infantry leave their foxholes after a carefully executed assault on a British position. A Crusader platoon lays destroyed and burning in the center of the battlefield. With prior commitments, I won't have the chance to play very many games in the coming weeks. I'm looking forward to painting and getting my army setup for Canadian Nationals, I have a few ideas on how to base and paint the Dwarves I got free in order to play Kings of War. The rulebook should be out in the coming weeks and I look forward to it's release. As does most of our group, it's nice to have something new on the table. I think it'll be a fun game to pick up and get into a little more. My focus though will always be Flames of War, despite the perceived LW 'creep', I will keep an open mind and continue to play that system and it's expansions. MW will no doubt get some more re-writes and with some new models on the horizon, give me something to paint. 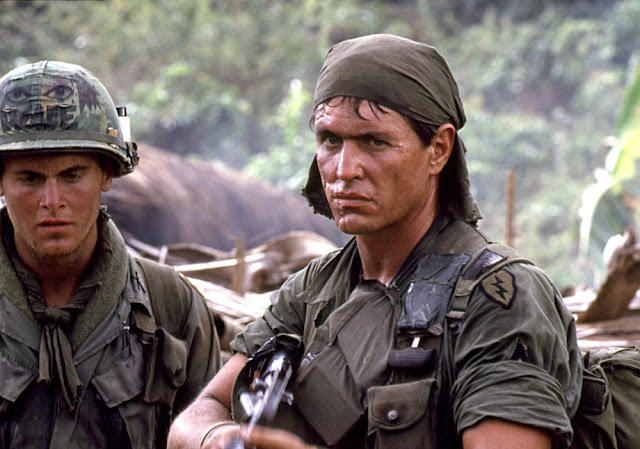 Just a friendly face to remind me I have a lot of Vietnam stuff to assemble and paint up. Really need to get a game of that in soon! The games of Kings of War are fast and furious. This past Friday I played a game against a new comer to 28mm - our own Phantom Rescue. He was given (yes - free!) a whole fantasy dwarf army on one condition - he paint it! So with this newly acquired horde, we faced off with 750pts a side. This time out I brought Kingdoms of Men - using old Warhammer Fantasy Empire models. Where did those come from you ask? I picked up just over 2000points, about half painted, for $40! This game was a blast, and it has spurred a few others in the group to start ordering models and pulling out old gear from the "good 'ol days" of GW gaming. Back at it Friday with test games of Kings of War. Apologies for the proxies, but a few of us are working out what faction we are going to commit to before buying the Mantic figures, so we are testing using what we have. Abyssal Dwarves VS Dwarves @ 750pts. Enjoy, I have 2 more battle reports coming tomorrow! 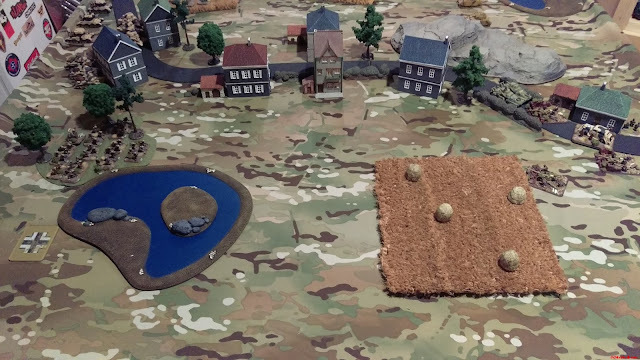 Flames of War games in the summer months generally indicate an upcoming event. In this case, Canadian Nationals are right around the corner. 05-06 Sep 2015, players from all over the country and the US will be in attendance. Messing around with lists in Mid-War has always been difficult for me to get my head wrapped around. I don't have a ton of Mid-War period armor, so I often find myself going with German Pioneers or Infantry. I chose to go a different direction in playing Dennis' Brits on Wednesday night. My list was a Panzerkompanie out of 'Eastern Front'. 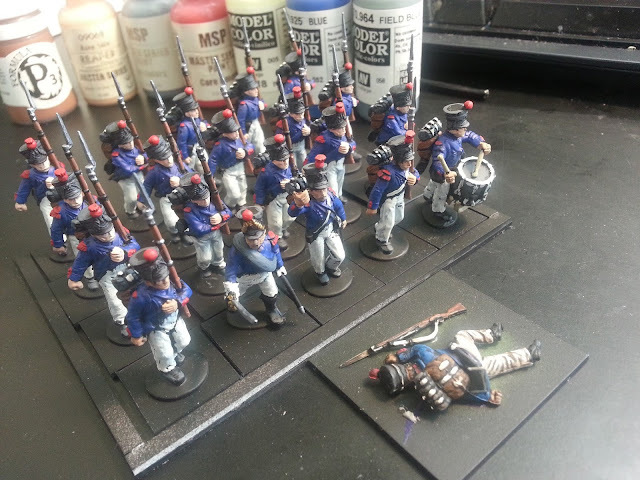 Four simple platoons, a little on the expensive side for some of the units as far as the 1710 pts level is concerned.